You know you're having a great workout when you "feel the burn." Sometimes, that burn can turn into actual pain. If you experience thigh pain in running, you may feel like there is a problem. There are several different reasons why this may happen. You may need to warm up more, you may have a physical condition that needs attention, or you may just be experiencing "the burn." This article addresses some of the reasons why you feel this and what you can do about it. Why Do I Get Thigh Pain When Running? You can get thigh pain because of the hard work your thigh muscles are doing. They are also taking a lot of impact with each running step. Your thighs are part of your body's "powerhouse" that propels you when you run. Athletes can easily strain a hamstring if they exercise too hard. 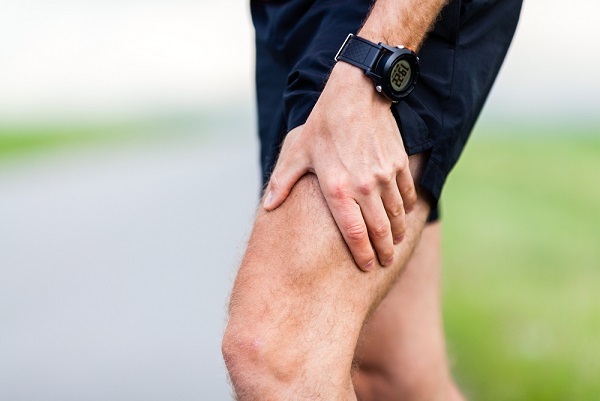 Runners experience this injury if they do not adequately warm-up. These four muscles run along the back of the thigh and give your knee the ability to bend. It is even possible to suffer a tear in the hamstring muscles when you strain them. This happens when you start running suddenly without stretching, stopping your run suddenly, or jumping and landing too hard. If you step or stretch your inner thigh muscles wrong you can pull a groin muscle. This can result in a ruptured groin or torn groin muscle. They can be very severe or even a mild pulled groin muscle can cause pain in the thigh when running. A severe pulled groin can have you out of the race until it heals. Your quadriceps tendons are bands of tissue fibers that work with the thigh muscles to help bend and straighten the leg at the knee. They also help keep the thigh muscles firmly attached to the leg bones. Your tendon can receive small tears that can make walking difficult and sideline you from other activity. These tears may need surgery and therapy until they fully heal. These are most common in older people who play sports and/or run. A hernia that is close the groin or in the femoral area may cause thigh pain when running. Hernias occur as the abdominal tissue pushes through the abdominal muscles. This is most common in the small intestines. It can also occur near the inguinal canals that can also cause pain in the thigh area. One of the lesser known quadriceps muscles is the rectus femoris muscle. This one attaches at the hip and again at the knee. This muscle helps lift or straighten your knee. It is quite possible to rupture this muscle or suffer from inflammation at the level of your hip. People who sprint run or kick are most susceptible to this injury. The five adductor muscles are attached from the thigh bone to your pelvis and they help your legs pull in and push out with ease. You have five different adductor muscles and they are most commonly used for running in a sprint, football, hurdles in track, and riding horses. Adductor inflammation occurs most often in the tendons that attach the actual muscles onto the bones. Strains from overuse or injuries can cause adductor inflammation that can cause pain in your thighs when you run. When you run, you need to start drinking extra fluids around 10 to 15 minutes after you stop your run. You will need to replace lost fluids even if you are running in cooler temperatures. You may not even know that your body still sweats even when the temps are cool. Your muscles need nutrients for recovery. Make sure you eat something after your run to give your muscles what they need to heal from a hard run. The best choices for this include: a cup of yogurt, peanut butter on crackers, a sandwich, or a smoothie with protein powder. If you stretch pre-run, give yourself a good stretch after you exercise. Stretch for about 10 to 15 minutes working on your major muscles like; thighs/quads, calf areas, hips, and hamstrings. Stretching after exercise will help bring blood flow and oxygen to your muscles and increase recovery. It may not be the most comfortable form of muscle recovery, but an ice bath helps relieve inflamed muscles. Fill a tub with cool water and add ice to it. Wait until the ice is melted or about 5 minutes and immerse yourself in the water. The first 3 minutes will be the hardest. Try to stay in the tub at least 10 minutes, but 15 minutes is optimal. The best way to prevent thigh pain is to prepare your muscles prior to your workout. Make sure the first time you run that you keep it short and light. Don't run more than 20 minutes the first time and build up from there. When you run, you should be able to talk to someone and not be too out of breath. Make sure you stretch your thighs/quads pre-run and eat a carbohydrate rich meal. Drink plenty of fluids and make sure you get plenty of rest the night before your run.